Our next destination was the Kauaeranga Valley in Coromandel Forest park where a clutch of DOC campsites are set in a forest environment. A long gravel road took us up from the modern but shut Info Centre towards the site, more basic this time, no showers or kitchen but water from a stream and toilets ... all you really need anyway. We set up camp and made food – the tent was really suffering at this stage, sagging in and we'd been lucky it hadn't rained – the masking tape wasn't enough - we needed a new pole or a new tent but it would have to do. We taught Sylvia and Oli cacho and played into the night. The sky was unbelievably clear and with no light pollution at all we were able to see more stars than even depicted on the planosphere. Unbelievably beautiful. At some point in the evening, as we emptied the carton of wine, Sylvia had an accident with one of the candles and one of the sleeping bags. There seemed to be some tension so we retreated to watch the sky before retiring. Birdsong and strong sunlight awoke us and we left the camp for the day. Sylvia and Oli weren't talking after the previous night's debacle and a silence descended on the car as we drove across the peninsula towards Hot Water Beach, a place Claire had told me about which intrigued me. We arrived and I rented a spade. Hot Water beach is a truly bizarre place, where the tectonic fault is so thin that you can dig a hole in the beach at low tide and the seawater that rushes in is geothermicaly heated. Understandably the beach was beset with tourists vying for digging spots although by the time we were there most of the areas were taken except for the super hot place directly above the fault, so hot that it was impossible to stand on the sand for more than a few seconds. We wandered about looking for somewhere to squat down and luckily some Irish people in a pool overheard my accent as I passed. They said they had had enough of being Irish Stew and gave us their pool. “Watch out for the spuds” was their passing remark. We sat and enjoyed the sensation of the sandy jacuzzi without bubbles for an hour or so as the tide came in and eventually destroyed the pointless reinforcements I had made. Cool water flowed in and quenched the heat. We had a terse lunch overlooking the beach, Claire and I making conversation but not getting much out of Sylvia. Onwards and upwards to Cathedral Cove, a place that I had seen for the first time just beforehand in the Narnia movie “Prince Capsian” (we bought a rip off DVD of it in Buenos Aires). It was a 30 minute hike down through flowering bushes with great views of islands in a turquoise sea. I would have thought we were in Thailand if I didn't have a NZ stamp in my passport. 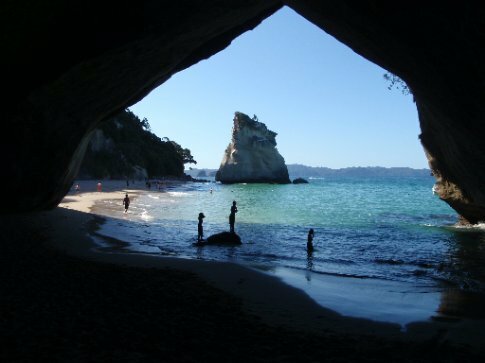 The cove itself is amazing – 2 silver sandy beaches separated by a gleaming white cliff but joined by a cave through the cliff, formed by long years of sea and wind erosion. We had probably the nicest dip in the sea I think I've ever had and played frisbee with Oli, Sylvia preferring to sunbathe. Sandy, we made our way back to the campsite, radio silence being maintained in the front seats (not even a few tunes!) for the 2 hour drive. We made it to Thames' Warehouse in time to buy a replacement tent and headed back.